Staying dry isn't the only problem that comes with riding in the rain, but between the greyness of the skies and the downpour coming down, remaining visible to traffic becomes difficult in its own right. 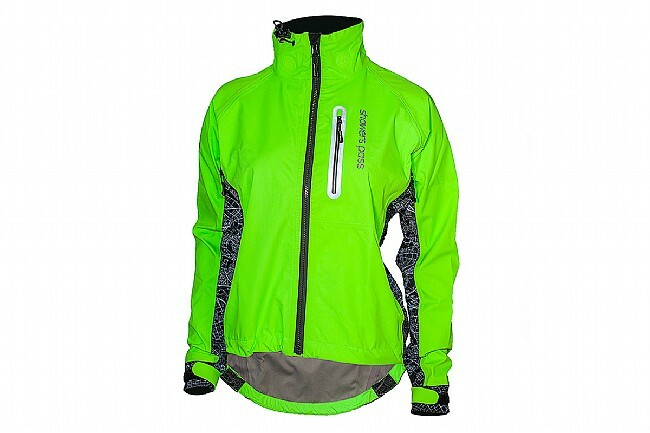 Showers Pass keeps you protected on both fronts with their Hi-Vis Elite Jacket, combining their highest-rated 3-layer waterproof / breathable fabric with a day-glow neon green color, MapReflect side panels, and 4 integrated LED Beacon lights. Make no mistake, the Hi-Vis Elite Jacket isn't compromising on performance just because it has also placed a heavy focus on safety. All the top-tier features you've come to expect from Showers Pass are present here, with plenty of ventilation coming from a large back vent, two zippered side vents, adjustable cuffs, and the YKK® Aquaguard front zipper with storm flap. A soft collar extends up high without causing irritation, and storage is on the mark with a large zippered rear pocket and zippered chest pocket with headphone port. LED Beacon lights run for up to 200 hours using user-replaceable CR2032 batteries.